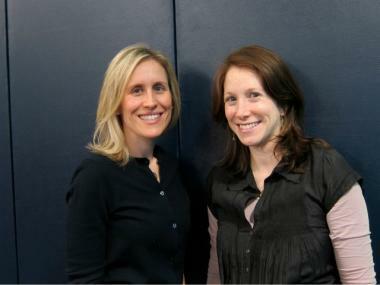 Marcy Singer (left) and Alissa Schmelkin met at sleepaway camp when they were 9. Nearly 25 years later the best friends are opening the first and only dedicated space for the popular camp sport gaga. MANHATTAN — With gaga all the rage for the summer camp set — the sport, not the pop sensation — two Upper East Side moms are opening the first and only space in Manhattan dedicated solely to the Israeli dodgeball-like game. Alissa Schmelkin and Marcy Singer, best friends who both have two sons, didn't want them playing it in their apartment living rooms. So, on Saturday, they're opening the 3,000-square-foot Gaga Center at 230 E. 93rd St. 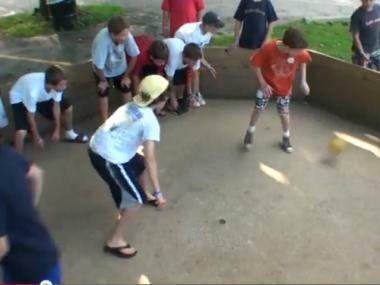 The game is played in an octagonal pit that involves dodging, striking, running and jumping while trying to touch opponents with a ball below the knees. "They were playing in the house," said Singer, 36. "Our lamps and everything else were in danger. We were like, this is ridiculous. This has to end. The ball kind of flies all over the place." She and Schmelkin — Long Island-natives who met at a Pennsylvania sleep-away camp when they were nine years old — were in Central Park one day as their boys, who range in age from 4 to 8, were attempting to play a game of gaga without the octagonal pit. "We were talking about what classes they were going to take," Singer recounted when a light bulb went off. "It's like bowling without a bowling alley," Singer said. "You can't do it." Singer, who was in the business world and then got a Master's in education, and Schmelkin, who is a former journalist, spent a year trying to find the right space that was bright and airy, with high ceilings as opposed to the dingy basements many after school classes take place in. "We wanted a place with daylight and high ceilings," Singer said. "We wanted to create a play with music, an upbeat space where kids can burn energy." The Gaga Center will have an inaugural trial week of free classes before kicking off a 12-class spring session for boys and girls, ages 4 and up, on Mar. 5 that will cost $620. They will also host birthday parties for kids and adults. Classes are already filling up and birthday parties have already been booked, Singer said. "It's a really great sport for everyone," Singer said of the game she considers less aggressive than dodgeball and more high energy. "You don't need to be an amazing athlete to play. You don't have to be into a traditional sport to run around, get exercise and have fun." "We found a need in New York City. It's very rare to find something today that doesn't already exist for kids." The Israeli game, which has been around for years, preceded the meteoric rise of Lady Gaga. But the famed singer might make an appearance at the center. "We'll be sure to play some Gaga in the space when we open," Singer said.